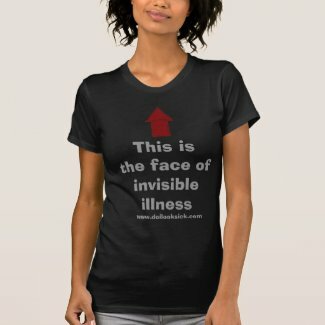 This is the Face of Invisible Illness – Do I Look Sick? Do I Look Sick? YES. Because “normal” is how a sick person looks. Tired of explaining this? You’ve been there and done that, now get the T-shirt! And order before midnight and use code FRIDAYFLSH14 to get %15 off your entire order! Happy weekend! Here in Texas it’s snowing and I’m slowly but surely getting over this cold thing. I’m just glad I didn’t get my Alma Mater’s zombie disease.